Two scintillating theatrical pieces were served up in Edinburgh to celebrate the centenary of International Women’s Day. One homely and intimate, set in the cosy Word of Mouth Cafe. One political, rousing and set in the grand Lyceum Theatre. 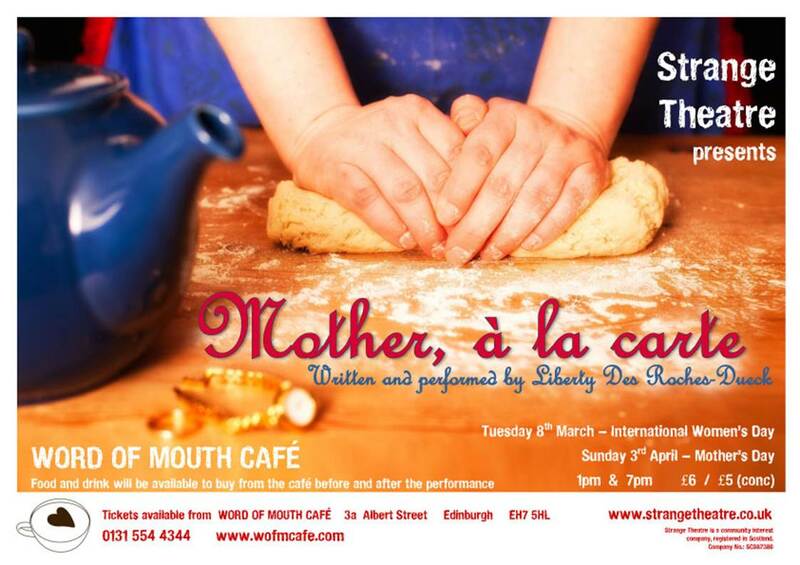 ‘Mother, A La Carte‘ is a delightful one-woman show beautifully set in a tiny café off Leith Walk. A woman bakes bread, brews a pot of tea and contemplates being a woman. Simple, emotional and stunningly powerful. She wraps herself up in clingfilm to keep her marriage exciting, wails about her mother’s constant injunction for perfection and yearns for the wild joy in her life – a bit of madness with reason. The audience helps pass props from around the cafe, the counter becomes an earthy kitchen worktop and a surprising amount of eyes are dried at the final applause. All in all, a heart-warming offering from the exciting new ‘theatre of the oppressed’-inspired theatre company Strange Theatre. Next performance is on Mother’s Day, funnily enough. ‘Cat and Mouse‘ by Ajay Close was a rehearsed reading for an audience of women with a couple of token, but I’m sure very welcome, blokes. The abridged reading follows the true story of Scotland’s suffragettes on hunger and thirst strike in Perth Prison. But not so closely that it loses dramatic impact. Instead, it concentrates on the power-play relationship between strident, upper-class lady prisoner, Arabella Scott and the brutal, jumped-up working class Dr Ferguson Watson in charge of force-feeding. Although still a work in progress, the quiet contempt of Phil McKee‘s doctor was chilling. The casual nature of torturers convinced they are treating the underclass was convincingly drawn throughout the 50 minute performance. It was also refreshing to see women as terrorists on a main stage. Albeit upper-class ones in the main. Disappointingly in women’s history, working class women did not get the vote until 1928 and there were few terrorists involved in that struggle. But that story, perhaps, is for another day. You can re-read this article on STV Edinburgh here, if yer that way inclined. Due to incredible demand, Mother A La Carte will also be performed on Monday 4th, Tuesday 5th and Wednesday 6th April at 7pm. Tickets: £6 / £5 (conc.) available from at Word of Mouth Café 0131 554 4344 www.wofmcafe.com. Running time 45 minutes and not suitable for children. The café will open at 6pm. The kitchen has to close for the performance so last orders will be taken at 6.30pm. Please arrive early.